Honduras' location in Central America. 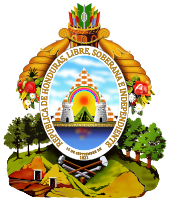 The following is an alphabetical list of topics related to the Republic of Honduras. ^ The division of the Americas into the continents of North America and South America is somewhat arbitrary. Most commonly, Panama is considered to be a part of North America and Colombia is considered a part of South America. Geologically, the boundary between the two continents is defined by the boundary between the Caribbean Plate and the South American Plate. This places the boundary roughly along the Panama-Colombia border. Other definitions place the boundary at the lowest natural crossing of the Isthmus of Panama near the Panama Canal, or along the canal itself. Another definition places the boundary at the lowest crossing of Central America near Lake Nicaragua. This definition splits Central America between the continents of North and South America. ^ a b Central America is defined as the southeasternmost extent of North America, most commonly including the seven nations of Belize, Guatemala, El Salvador, Honduras, Nicaragua, Costa Rica, and Panama.